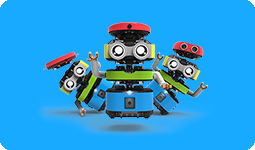 IronBot is an innovative series of products designed by RoboSpace for children’s STEM and robot education. In this series of products, smart phones can be used to act as the brains of robots, which can not only display facial expressions, but also carry out a variety of voice and visual interaction. 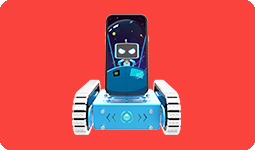 Combined with the latest Internet of Things (IoT) and cloud technology, the addition of smart phones makes IronBot series more interesting and interactive than other DIY robot kits of the same type. IronBot Mate (Mate), RoboSpace’s first-generation product, has raised a total of $30,000 on Indiegogo, with buyers in 25 countries. Mass production was officially realised in November 2016. The sales volume of 600,000 yuan was achieved within two months through the cooperation of agents in eight provinces and cities. Mate is an advanced version. Users can start from understanding the servo motor, and freely build mechanical arm, foot race robot and humanoid robot etc. according to the difficulty of assembly, so as to exercise their hands-on ability and innovative thinking. However, the hardware is just the beginning. How to apply software programming to build a robot brain is more important. This method of mind mapping requires no coding. By wirelessly connecting the robot’s control motor through the Bluetooth function of the mobile phone or tablet, the XLink graphical module in the application, such as the voice recognition synthesis module and the camera call module, can be dragged, stitched, and arranged, as well as complete the commanding action and the setting of name, character, dialogue, expression, sound, story, etc. of the robot. Qiu Binghui believes that graphic programming is an effective way to train children’s logical thinking and programming thinking. Through market research, it was found that although Mate had better display effect and expressiveness, there were differences in users’ demands and operational abilities among different age groups – assembling for a long time is a test of patience. Therefore, Chap, which is entry-level and more economical for children, came into being. Chap is an update and upgrade based on the continuation of the first generation of Mate. Chap is very simple to build, an 8-year-old child can assemble a fun robot independently in 40 minutes. In terms of intelligent control, Chap follows the idea of Mate, integrating XLink graphic programming function, supporting intelligent devices such as mobile phones and tablets. Chap, in addition, adopts the standard interface, which belongs to the same system as Mate, two products can be pieced together. Since the launch of Jingdong crowdfunding, Chap has completed the crowdfunding target of RMB 100,000 in one week and has accumulated support from 1,593 users. Xiamen JornCo Information Technology Co., Ltd. (JornCo Technology), located in Xiamen, Fujian province, is a startup engaged in the research and development of small robot technology and derivatives in the People’s Republic of China. 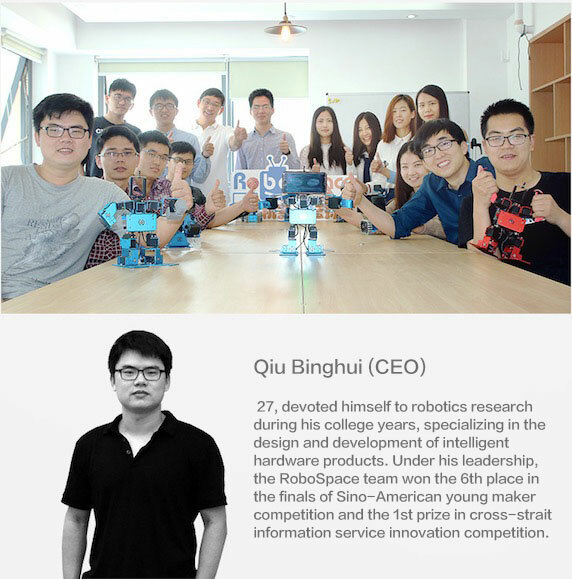 Founded by Qiu Binghui (CEO) in 2015, JornCo technology is committed to building RoboSpace®, a creative realisation and sharing platform that can build modular robots for children aged 4-16 who are interested in robots. 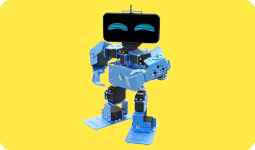 As a self-owned brand, RoboSpace® focuses on the design, research and development of intelligent technology products for STEM education, attaches importance to inspiring children’s creativity with science and technology, and is determined to create a new generation of science and technology education brand. Meanwhile, RoboSpace is also a powerful cloud platform. Through the demand analysis of users of different ages, the brand products can be subdivided to form the product process matrix; the modular design structure can not only meet the needs of mutual independence and integration between products, but also can be upgraded constantly; data can be interconnected to form an organic combination of toys, consumer electronics and teaching aids. Children and parents can learn coding, control and play games online through apps, websites and software, and the cloud platform will automatically collect user data and provide advanced services through big data and AI, including interactive communities and brand malls, etc. RoboSpace will be built into a platform for children’s games, parent services and product integration. We hope that the products of RoboSpace can expose children to interesting robots at an early age, learn STEM education and related knowledge of robots while practicing happily, and create their own unique robots according to their imagination. We hope to build RoboSpace into a community platform for children to communicate with parents and teachers about science and technology, education, and share experiences, so as to promote the development of STEM education in China. IronBot was presented to former US Secretary of State John Kerry and Vice Premier Liu Yandong as a maker gift of the 7th China-US exchange and consultation in June 2016.